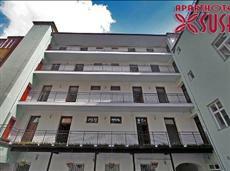 Hotel Susa is very pleasant and comfortable aparthotel with a friendly atmosphere and high-quality services. It is located in the quiet neighbourhood of Kralovske Vinohrady just few minutes from the city centre well placed for discovering Pragues historical beauty and night life. Kralovske Vinohrady (in translation the King's Vineyards) is one of Prague's high-class neighbourhoods, situated in an area with parks and a great variety of coffee bars, night clubs and restaurants with with all types of world cuisine. Historical monuments, beautiful Prague architecture and shopping is also available close to the hotel. Hotel Susa provides you with quiet and comfortable accommodation in the centre, full of turist events. The nearest tram-station is located one minute by walk from our hotel and the underground (metro) about 4 minutes of walk.